Just like their human companions, canines can gain weight. Also just like humans, carrying extra weight can be dangerous for dogs. Obesity can lead to a number of health issues that can significantly reduce their quality of life, as well as their lifespan. Health complications that can result from canine obesity include an increased risk of obesity, torn anterior cruciate ligament (ACL), cardiovascular disease, high blood pressure, and even the development of certain types of tumors. Needless to say, if it seems like your furry friend has packed on a few extra pounds, you’re going to want to help him get back is sleek physique. When you want to lose weight, you can start a diet and exercise regiment on your own, but your pet can’t; therefore, it’s up to you, his best friend, to help him shed the weight. One of the easiest ways to help your four-legged family member drop the extra pounds that he’s carrying is by changing his dog food to a weight loss formula. Combined with regular exercise (make sure you get him a well-fitted dog harness and/or dog collar, as well as an appropriate leash, so you can take start taking him on regular walks), you can successfully help your pooch drop the weight. One your pet gets back to an appropriate weight for his breed, you’ll start to notice a huge difference in his disposition, his activity levels, and his overall health and well-being. In this review, we’re going to talk about one of the key factors in helping your furry friend drop those excess pounds: dog food for weight loss. What exactly is dog food for weight loss? How does it differ from standard dog food? We’ll answer those questions and more, but first, we’re going to share our top picks for the best weight loss dog food. Now that you’ve had a look at what we believe to be the best weight management dog food, let’s take a closer look at each option. Below, we provide a detailed overview of each formula so you can decide which one is the best choice for your pooch. In each review, we share the ingredients used in the formula, what we like about the dog food, and what other pet parents who have used the weight loss dog food have had to say. After you read through the reviews and decide which one is the best choice to help support your pup’s weight loss, click on the buttons to find the best prices currently available on Chewy and Amazon. 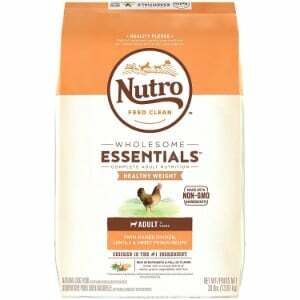 First up on our list of the best dog food for weight loss is Nutro Lite and Weight Management Adult Dry Dog Food. Made with premium quality ingredients that have been hand-selected for their nutritional quality and taste, your pup will be back to his appropriate weight in no time when you fill his dog bowl with this dry dog food. This formula is crafted with a specific blend of protein and fiber to help support weight loss and control weight gain. Farm raised chicken is the first ingredient, which not only offers a fantastic taste that your pet will love, but also helps to improve the development of lean muscle mass, which is so important for dogs; particularly breeds that are predisposed to joint issues, such as Great Danes, Dobermans, Dachshunds, and Bernese Mountain Dogs. Sources of fiber include lentils, rice bran, whole brown rice, barley, sweet potatoes, peas, and applies, which are also easy to digest so this food won’t cause an upset stomach. Blueberries and supplements offer antioxidants to further encourage healthy weight, and amino acids help to promote skin health and will improve the quality of your pet’s coat, too. The infusion of a variety of essential vitamins and minerals will improve your canine companion’s overall health and well-being. Futhermore, the ingredients are non-GMO, and no artificial colors, flavors, or preservatives are used in this formula, so you can have confidence knowing that your pet is eating a high quality dog food. Final Verdict: Nutro Lite and Weight Management Adult Dry Dog Food is a great choice for dogs that need to lose weight. This formula is made with premium quality ingredients and is specifically formulated to assist with weight loss and weight management. 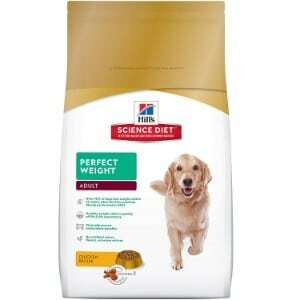 Next up on our list of the best weight management dog food is Hill’s Science Diet Perfect Weight Adult Dog Food. Pet owners have been trusting Hill’s Science diet dog food to nourish their canine companions for decades, as this dog food manufacturer offers a variety of formulas that are made by animal nutritionists and veterinarians to ensure optimal health. This specific formula is made for dogs that are prone to weight gain, such as older dogs that are less active or those who have been neutered. The first ingredient in this formula is real chicken, so it offers up a healthy dose of protein to support lean muscle mass and healthy joints. Ingredients like cracked pearled barley, brown rice, oat fiber, and dried beet pulp are easy to digest and will fuel your dog’s energy levels. It’s also infused with essential vitamins and minerals, such as vitamin B12, folic acid, calcium, taurine, vitamin D3, and vitamin A. Apples, broccoli, cranberries, and green peas add to the taste and the nutritional content. Furthermore, more than 70 percent of dogs that are fed this formula lose weight within 10 weeks. Final Verdict: Hill’s Science Diet Perfect Weight Management Adult Dog Food is specifically made to support weight loss and weight management. It’s formulated by veterinarians and animal nutritionists and 70 percent of dogs that are fed this formula lose weight within 10 weeks. According to most pet parents, it offers great results and their pets like the flavor. Purina dog food is another trusted manufacturer of a variety of formulas for dogs of all breeds, sizes, and ages. Their Pro Plan FOCUS Weight Management Formula Adult Dry Dog Food is made for all adult canines that need to lose weight, no matter their breed or size. 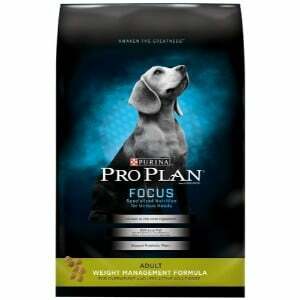 This Purina Pro Plan dog food for weight loss is formulated to offer 100 percent balanced nutrition. It is meant to support your pup’s overall health and well-being. The first ingredient is chicken, so it offers up a healthy dose of protein. It also contains easily digestible wheat bran and brewers rice to provide your pup with the energy he needs. Natural sources of glucosamine will help to strengthen your pet’s joints and can potentially stave off issues like arthritis and hip and elbow dysplasia. This formula also contains 25 percent less fat than other Purina Pro Plan dog food options for adult dogs, which further ensures that it will help your pup lose weight. Most pet parents say that they are very happy with the results and that their furry family members’ love the taste. Most pet parents say that they have noticed positive weight loss results after feeding their overweight dogs’ this formula. Final Verdict: If your pet needs to lose weight, Purina Pro Plan FOCUS Weight Management Formula Adult Dry Dog Food is a good option to consider. It’s a low fat formula that is made to support weight loss and weight management, and it also contains essential nutrients to improve your pet’s overall health and well being. If your canine is carrying around extra weight, then you might want to consider feeding him the Fat Dogs Dry Dog Food, which comes from the makers of Natural Balance dog food. Natural balance is another highly regarded brand of dog food that offers a variety of formulas for dogs of all breeds, ages, and sizes, such as senior dog food, puppy food, and wet dog food. As the name suggests, their Fat Dogs recipe is specially formulated for overweight adult dogs. This dry kibble will help to support your dog’s weight loss, as it is a low calorie, yet nutritionally balanced dog food. It also features a special blend of protein and fiber that will help to keep your pooch feeling fuller for longer so he won’t have the urge to eat as often. Ingredients include chicken and salmon meal for protein, garbonzo beans, peas, barley, oats, and dried beet pulp for fiber and carbohydrates, and a variety of vitamins and minerals to keep your pet strong, healthy, and well-nourished. Like all Natural Balance recipes, every batch of this formula undergoes 9 safety tests to ensure that the best ingredients are used and that the food is safe. These tests are performed by microbiologists and chemists, and the results are displayed right on the Natural Balance website to assure customer confidence. Some users said that the quality of the product was much lower when they purchased it from Amazon then when they purchased it from the pet store. 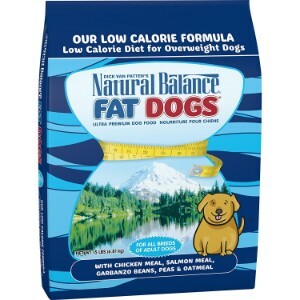 Final Verdict: To encourage weight loss in your pup, Natural Balance Fat Dogs Dry Dog Food is a wonderful option to consider. Most pet owners confirm that this formula has successfully helped their dogs lose weight, and they report that their pups like the flavor. Last, but definitely not least, on our list of the best dog food for weight loss is Blue Buffalo’s Life Protection Formula Natural Adult Healthy Weight Dry Dog Food. 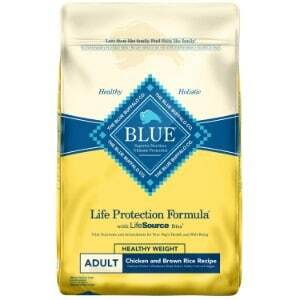 Blue Buffalo dog food is one of the most highly regarded dog food brands on the market. That’s because they only use the best possible ingredients to ensure that pets receive the best possible nutrition. Their recipes are also made under the guidance of holistic veterinarians and animal nutritionists, so you can have confidence knowing that your furry friend will receive superior quality food. Blue Buffalo’s Life Protection Formula features real meat as the first ingredient, just like all of their other recipes. In this formula, the protein is sourced deboned chicken. It also features wholesome whole grains, like brown rice, barley, and oatmeal to promote healthy digestion. Fruits and vegetables, like cranberries, blueberries, potatoes, peas, sweet potatoes, and carrots are also included in this recipe to improve the nutritional content and the flavor. Like all Blue Buffalo products, there are absolutely no artificial colors, flavors, or preservative. It also contains Blue’s exclusive Life Source Bits, which contain a precise blend of antioxidants, vitamins, and minerals. It’s also completely free of grains like corn, wheat, and soy, and no byproduct meals are used in the recipe. Final Verdict: To help your pet lose weight and ensure that he is getting the nutrition that he needs to thrive, consider feeding him Blue Buffalo Life Protection Formula Natural Adult Healthy Weight Dry Dog Food. Made with premium quality ingredients and specially formulated to feature a lower calorie and fat content, this recipe will help your pup stay satisfied and lose weight. When it comes to selecting food for your pet, you want to make sure that you are selecting a high quality product that will meet his nutritional needs to ensure that he maintains maximum health. If your pet has gained weight or if he is prone to weight gain (as some breeds, like Beagles, are), then you should consider feeding him a specially formulated dog food for weight loss. In this portion of our buyer’s guide, we’ll share some important insight about weight management dog food so that you can ensure you are choosing the very best option for your four-legged family member’s needs. Obviously, you don’t want your pet to experience any of these issues; therefore, if you want to ensure that he maintains a healthy life, veterinarians recommended feeding overweight canines, as well as canines that are prone to obesity, dog food that is specially formulated to support weight loss and weight management. How can you tell if your do is carrying too much weight? A routine checkup at with your vet will confirm; however, there are signs that indicate your pup is too heavy. For example, if you can’t feel his ribs, if he isn’t as active as he used to be, if he’s panting more than he usually does, or if he just looks and feels heavier than he normally does, then chances are that he’s too heavy. Reduced calories. A dog food that has a lower calorie content can help your pup shed weight. Any calories that your pet doesn’t consume will be stored into fat, which will eventually lead to extra weight. Therefore, feeding your pet less calories can help to encourage his weight loss. Low fat. Like too many calories, too much fat can also lead to weight gain. A high quality dog food for weight loss will feature a reduced fat content to support weight loss. High quality protein. While protein contains calories, in order to process it, your dog will have to burn more calories, which will translate to weight loss. High quality ingredients. Like any type of dog food, a high quality food for weight loss will be made with premium quality ingredients. Real meat, fruits, vegetables, and healthy sources of fiber and carbohydrates are all indictors of a premium quality food. In order to select the best weight loss dog food, we enlisted the help of veterinarians and animal nutritionists. Our panel of experts helped us analyze the ingredients in several different weight loss formulas to determine which options best support weight loss will offering balanced nutrition. The information we collected, coupled with the countless reviews that we read, allowed us to narrow down the options to the five formulas that are featured in our review. If your furry friend is carrying too much weight, it’s important to make an effort to help him lose the added weight. Making sure that he receives plenty of exercise and feeding him a premium quality weight loss for dogs are two of the best ways that you can assist your pet with weight loss. All of the formulas featured in our review are proven to support weight loss and manage healthy weight.